[PDF] Should We Worship Jesus? Greek: latreuo-to minister, render religious homage, serve, to do service, worshiper. Philippians 3:3 For we are the circumcision, who worship God in the Spirit, rejoice in Christ Jesus, and have no confidence in the flesh. Acts 24:14 But this I confess to you, that according to the Way which they call a sect, so I worship the God of my fathers, believing all things which are written in the Law and in the Prophets. Matthew 4:10 - "You must Worship Yahweh your God and you must serve him only." Hebrews 1:6 - "And let all the angels of God worship him." Behold, I will make them of the synagogue of Satan, which say they are Jews, and are not, but do lie; behold, I will make them to come and worship before thy feet, and to know that I have loved thee (Revelation 3:9 [KJV]). Let people serve thee, and nations bow down [shachah] to thee: be lord over thy brethren, and let thy mother's sons bow down [shachah] to thee: cursed be every one that curseth thee, and blessed be he that blesseth thee (Genesis 27:29). 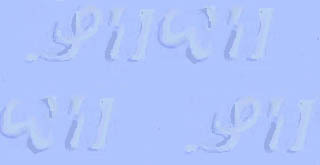 In the Septuagint, shachah is translated with the word proskuneo, which means virtually the same thing as its Hebraic counterpart. The Hebrew word shachah and the Greek word proskuneo account for more than 80% of the appearances of the word “worship” in most English versions of the Bible. "Shachah" (Strongs) OT:7812 shachah (shaw-khaw'); a primitive root; to depress, i.e. prostrate (especially reflexive, in homage to royalty or God): KJV-bow (self) down, crouch, fall down (flat), humbly beseech, do (make) obeisance, do reverence, make to stoop, worship. "Proskuneo" (Strongs) NT: 4352 proskuneo (pros-koo-neh'-o); from NT:4314 and a probable derivative of NT:2965 (meaning to kiss, like a dog licking his master's hand); to fawn or crouch to, i.e. (literally or figuratively) prostrate oneself in homage (do reverence to, adore): KJV-worship. A study of the Hebrew word shachah and the Greek word proskuneo reveals that both these words mean “to bow down.” The Hebrew word shachah (Strong’s number 7812) is used of bowing or prostrating oneself, often before a superior or before God. F. Brown, S. Driver, C. Briggs, The Brown-Driver-Briggs Hebrew and English Lexicon (Hendrickson Publishers, Peabody, MA, reprinted 2000), p. 1005. In the King James Version, it is translated by a number of different English words, including: “worship” (99 times), “bow” (31 times), “bow down” (18 times), “obeisance” (9 times), and “reverence” (5 times). The Greek word proskuneo (Strong’s number 4505) comes from the Greek words pros, “to” or “toward,” and kuneo, “to kiss.” It literally means to kiss the hand to (toward) someone in token of reverence, and among the Orientals, to fall upon the knees and touch the ground with the forehead as an expression of profound reverence. Hence, in the New Testament it means kneeling or prostration to do homage or make obeisance, whether in order to express respect or to make supplication. Joseph Thayer, Thayer’s Greek-English Lexicon of the New Testament (Hendrickson Publishers, Peabody, MA, reprinted 2000), p. 548. Lot “worshiped” (shachah) the strangers who came to Sodom even though he had never seen them before. He prostrated himself before them to show them respect (Genesis 19:1). Moses “worshiped” (shachah) his father in law, whom he respected and honored (Exodus. 18:7). Abigail “worshiped” (shachah) David (1 Samuyl 25:23, 41). She honored him by prostrating herself before him. These three examples can be multiplied many times over, but they show that when someone wanted to honor another, he would fall down before him. The act of falling down is called “worship,” and reveals the heart of the worshiper—respect and honor towards the one being worshiped. "And David said to all the congregation, now bless Yahweh Almighty. And all the congregation blessed Yahweh Almighty of their fathers, and bowed down their heads, and worshiped Yahweh, and the king," (KJV). "Then David said to all the assembly, "Now bless Yahweh Almighty." And all the assembly blessed Yahweh the Almighty One of their fathers, and bowed low and did homage to Yahweh and to the king," (NASB). "Then David said to the whole assembly, "Praise Yahweh Almighty." So they all praised Yahweh, the Almighty One of their fathers; they bowed low and fell prostrate before Yahweh and the king," (NIV). "Then David said to all the assembly, "Now bless Yahweh your Almighty One." So all the assembly blessed Yahweh of their fathers, and bowed their heads and prostrated themselves before Yahweh and the king," (NKJV). "Then David said to all the assembly, "Bless Yahweh your Almighty One." And all the assembly blessed Yahweh, the Almighty One of their fathers, and bowed their heads and paid homage Yahweh and to the king," (ESV). Bow Down - Do Homage! 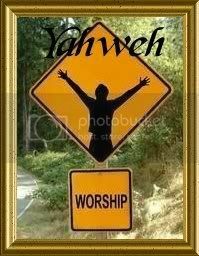 "Worship" of Yahshua is NOT "Worship" of God! Can We “Worship” Jesus Christ?